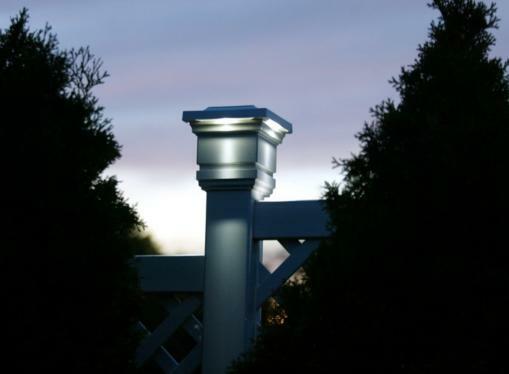 An ideal solar light accent for decks, fences, mailbox posts, walkways or anywhere soft accent light is needed. The solar "Classy Cap" is especially designed for fence and railing use. The solar panel on top of the cap converts sunlight into electricity, allowing for up to ten hours of light per night. Manufactured from UV stable prime PVC guaranteed not to fade, yellow or rust. Comes with four high output LED ultra bright lights. No wiring required. Each size will fit over any standard 3 1/2" or 4" square vinyl or wood post. • Fits over any standard vinyl or wood post. • Two year manufacturer guarantee. • Comes with two long life batteries. • Battery life of two years. • 4 watt per fixture.